Designed by Morph exclusively for Joseph Joseph, the versatile Slice & Serve™ performs several functions and makes a great food presentation piece for any table. 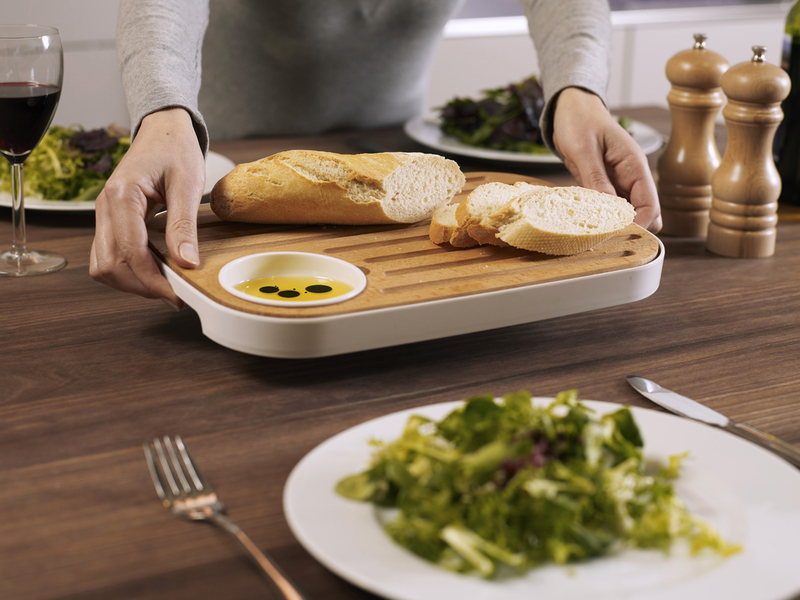 It comprises a high-quality beech board that sits inside a smart melamine tray with removable condiment dish. One side of the board is for bread with crumb-catching grooves cut into the surface. Bread can be cut and served at the table, with butter or oil & vinegar in the integrated condiment dish. The reverse of the board is flat and ideal for serving foods such as cheese and biscuits with pickles or chutney in the condiment dish. The melamine tray base has non-slip feet and convenient carry handles.